The AeroFlo 84 is designed for 84 plants and is ca. 290 cm long, ca. 195 cm wide and ca. 32 cm high. It's useable volume is 220 litres. We deliver complete -including the needed fertilizers (2 times one liter and Flora Micro in half-liter bottles for wether hard or soft water). The provided pump is a HX6550 with 200Watt and an output of 5580l/h. 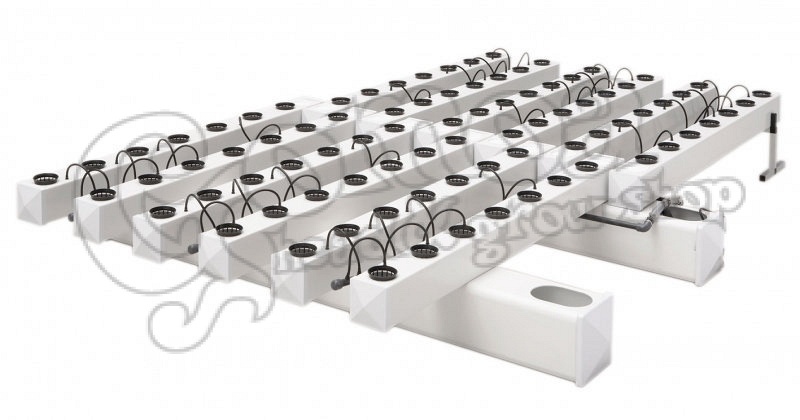 Legendary growth and yield are the hallmarks of the General Hydroponics AeroFlo System line. Countless growers, academics, and researchers across the globe agree that no other hydroponic system delivers the same staggering growth rates and robust crops. The AeroFlo super-oxygenates the nutrient solution to deliver oxygen, water, and nutrients in ideal combinations, thus creating a root zone environment that surpasses anything found in nature. This system creates stronger, more resilient plants, as well as increased yields. For the expert grower seeking to bring plants to harvest earlier and to maximize the productivity of their grow space, the AeroFlo produces unbeatable results.